The Four Agreements by Don Miguel Ruiz. I'm confident it will make the Rabbit Recommends cut. 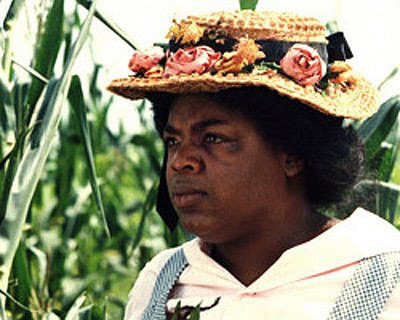 Q: Wasn't Oprah great in The Color Purple? A: She was. Columbine by Dave Cullen. Read the first chapter. Pride and Prejudice and Zombies by Jane Austen and Seth Grahame-Smith. Read the first chapter. See some psycho illustrations. What? This is a coincidence. But some of you might consider a name change since the stars seem to shine on the Bionic women of the world. 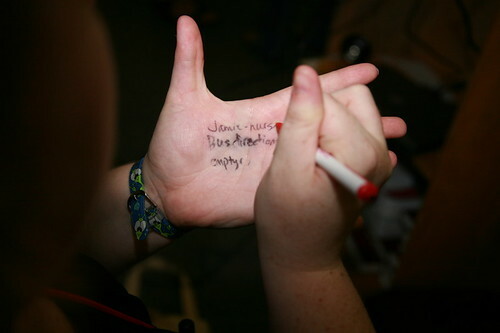 I knew that was your hand because you hold a pen like a 3rd grader. 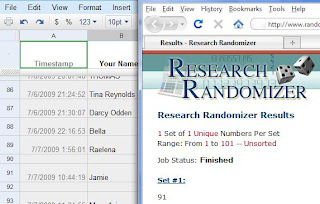 Thanks for the lovely shout-out, Jamie! I think you'll really like The Four Agreements. I can't wait to hear what you think. Please do share! I'd love to hear about P&P&Zombies too. My friend Katie and I have talked about reading it, but I'm still not convinced :) Thanks again! CB: Yelling at Harpo is the best! J: When I posted the pic, I thought "Will anyone notice my goober-way of holding my pen?" Thanks.